Jan. 11, 2018, 10 a.m.
By Shan Wang @shansquared Jan. 11, 2018, 10 a.m. The reporting readers say they want from news organizations and what they feel they get from news organizations continue to be mismatched. People across 38 different countries largely say they want a news media that covers political issues in a way that doesn’t favor one political party or another, according to a global study by Pew Research published Thursday. But in many of these countries Pew studied, partisan divides over whether news organizations cover politics fairly rule attitudes toward the media. An individual’s political orientation tends to be one of the strongest factors underlying attitudes about the news media, more so than age, education or gender. In the U.S., 52 percent said they thought news organizations don’t do well reporting political issues fairly. 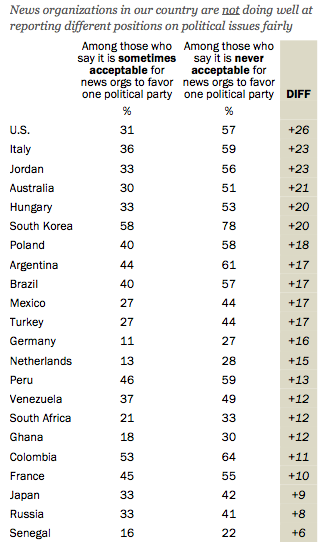 The U.S. didn’t have the highest levels of dissatisfaction among the countries Pew surveyed, though: In Greece that number is 80 percent; in South Korea, 72 percent. These two countries consistently ranked highest in media dissatisfaction: Greece and South Korea were the only two in Pew’s report in which the majority of people didn’t even think news organizations were doing a good job covering important news events (Greece 57 percent; South Korea 55 percent). The gap is largest in the U.S., where 24% of Republicans are mostly satisfied news consumers, compared with 58% of people who do not identify with the Republican Party, a 34-point difference. The opposite is largely true for the other countries Pew studied. In Hungary, for instance,supporters of the ruling Christian Democratic People’s Party are 20 percentage points more likely to be satisfied with news coverage than non-supporters. This yawning partisan divide aligns with another Pew report from last summer, which found that 89 percent of Democrats said journalists’ role keeping an eye on public officials was critical, but just 42 percent of Republicans felt the same. It was the largest partisan gap since Pew began asking the question in 1985. — People are more interested in national and local news than news not about their own country. And it turns out people outside of the United States aren’t actually that interested in news about the United States. — Rates of using social media to get news are unrelated to a country’s national economic status. People in emerging, developing economies are as likely to use social media for news as those in advanced ones: “In fact, the median percentages of people who get news at least once a day through social media are about the same in emerging and developing economies as in advanced ones (33% and 36%, respectively). Pew conducted its survey with 41,953 respondents across 38 countries from February to May of 2017. You can read their full report here. Photo of newsprint art by dfinnecy used under a Creative Commons license. POSTED Jan. 11, 2018, 10 a.m.
Wang, Shan. 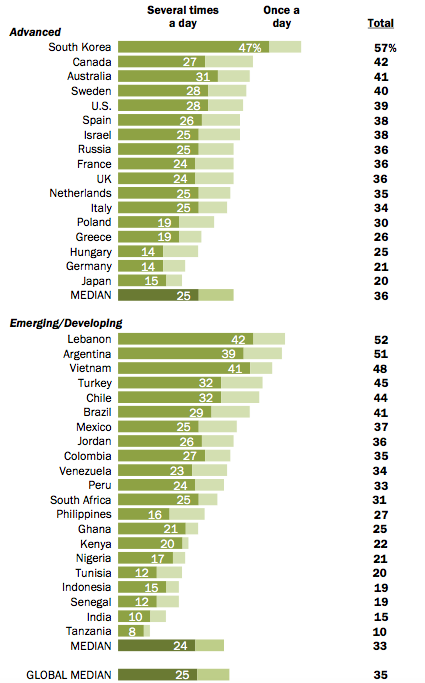 "Global unhappiness with the news media is high. In the U.S. (surprise!) partisanship drives what people think about the media." Nieman Journalism Lab. Nieman Foundation for Journalism at Harvard, 11 Jan. 2018. Web. 20 Apr. 2019. Wang, Shan. "Global unhappiness with the news media is high. In the U.S. (surprise!) partisanship drives what people think about the media." Nieman Journalism Lab. Last modified January 11, 2018. Accessed April 20, 2019. https://www.niemanlab.org/2018/01/global-unhappiness-with-the-news-media-is-high-in-the-u-s-surprise-partisanship-drives-what-people-think-about-the-media/.